The NorthSea provides high quality acupuncture in a comfortable, group setting while you stay clothed and relaxed in a fragrance-free environment. Like other community clinics, our services are low-cost and do not require health insurance. What makes us different is our orthopedic specialty and our collaborative approach in caring for your health and well being. We are located in the Northgate neighborhood, just minutes from I-5. Book your visit on-line or by phone at 206-524-6428. Occasionally, our Regular treatments are not enough to effectively treat structural problems caused by debilitating conditions or injury. These specialties can make the difference. Read our great reviews on YELP! ...and their hidden reviews, too. Community Acupuncture is a return to the traditional, group-setting treatment method used in Asia. 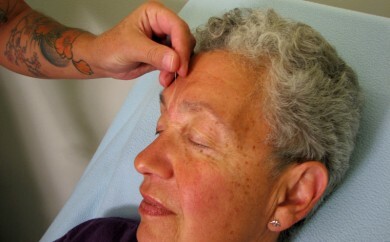 It is a comfortable, affordable, and effective way to heal for a wide variety of conditions. Laura helped me with the jaw tension on my left side. After about six visits the major knots in my jaw muscle had nearly melted. I didn’t know acupuncture could do that. I thought I would have to massage the knots out myself. Fantastic bed side manner. Thank you! I was very skeptical of acupuncture but now I'm a true believer. Brian is very professional, explains everything he's doing and adjusts his procedures to accommodate the current problem. As an athlete who receives bumps and bruises, coming to NorthSea has made a huge difference in my recovery time post-injury! Fantastic company and friendly staff. Highly qualified acupuncturists at incredible prices. They are really committed to the "community" model, but this in no way limits their ability to provide attentive, personalized, and effective treatments. They have successfully worked with me through pregnancy and migraines. The space is simple, clean, and calming. Booking appointments online is an excellent feature. Do yourself a favor and try this out! North Seattle Community Acupuncture has helped me enormously. What a wonderful community of folks who really care about your health. They are straight to the point in helping you diagnose your issues, I arrive on time and am escorted straight in for my session. So peaceful, so quiet, so kind and so affordable. I am able to commit to 2 times a week without breaking the bank. The appointments schedules online are so easy to book yourself in advance and choose your best appts. They send reminders pronto via email, love that!!! I have been going for months now and I am in less pain, my depression has lifted, my head is clear, I feel calm, centered, motivated, loosing [sic] weight and finally getting my life in balance. Bless these wonderful acupuncturists and all who enter their door. I cannot express enough gratitude and praise for this establishment. Steve, the owner, is kind, communicative, and very wise when it comes to diagnosis and treatment from a Chinese Medicine view. Without health insurance, I am left to rely on Acupuncture for healing and keeping well. This place is clean, easy to access, affordable, and full of good energy. Try it out sometime and see! I've had several appointments at this office and have had wonderful experiences. 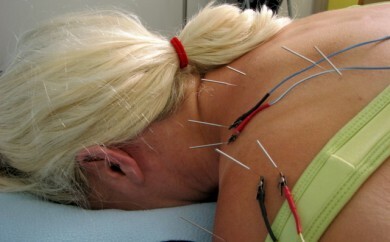 I've had treatments from three of the practitioners and all have been really nice people and skilled acupuncturists. I've' left the office with immediate relief from arthiritis [sic] pain in my finger joints and continuing improvement in TMJ pain in my jaw and ear. Their fee structure is affordable for even lower income patients, making it possible for some of us to get more regular treatments. These people have brought humanity back to medical care. For the first time in my life, I went tried acupuncture for migraine. I was a little nervous and a little scared, but I was my wits end when it came to my pain. Steve was amazing. He cleared up any concerns and made the whole experience awesome. Steve is friendly, calming and clearly knows his stuff. I can honestly say I'm almost looking forward to my next migraine just so I can go back. This place is such a gem. I was skeptical of acupuncture before trying them out, but I had a great experience and it definitely helped. Also, as a student on a budget the [sic] I'm so grateful for the affordable sliding scale. Definitely go here and support NSCA! I am so grateful to have found North Seattle Community Acupuncture. I did something to my knee and while I'm normally very active and healthy, I was hardly able to walk. After 5 visits, the pain is completely gone and I'm back to exercising, skiing and chasing my kid! 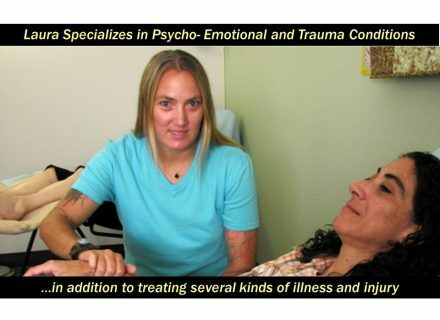 I had the pleasure of seeing all three therapists there - each one kind, caring and a great listener. They all have their own approach, but no matter what it was, it worked! Also, having the ability to easily book my appointments online was a huge bonus. What a smart thing to do for clients. Thank you for providing an affordable, convenient and incredibly healing environment to the community. No drugs, no side effects (except getting to relax for an hour), and real healing. I'm telling all my friends! This clinic is an asset to the neighborhood, offering affordable services in a clean, calm, and welcoming setting. The practitioners at this clinic are warm, knowledgeable, and professional, and it is a much more relaxing atmosphere than other community clinics I've been to. The online scheduling is fast and easy- I've always been able to book a same day appointment when I've needed it. I recommend it! Steve, Laura and Amanda are all amazing healers! This community set up allows them to keep the prices reasonable enough that one can really get the number of treatments that are required to help your body heal. I would hardly recommend this great approach to healing people. Steve is so knowledgeable of the body and caring for it. He has such a thoughtful and therapeutic manner with clients. So grateful to find such excellent and affordable healthcare!! Seriously, the folks at North Sea have become my go-to and main healthcare practitioners. Everything from tendonitis to bronchitis, they have helped me through. Great results, caring, professional competent and very talented people. Love them! Also quite pleasant surroundings. Amanda was lovely and healing throughout the process. My neck feels better today than it has in the past 20 years. I am thoroughly relaxed and rejuvenated. Thank you so much for the great qi! I love NorthSea Ortho & Community Acupuncture. My aches and pains are tenderly & effectively diminished. The staff is both compassionate and wonderful. An additional plus: I am so relaxed after each visit! My energy level is improving, along with greater awareness for the world around me. I am feeling the anxiety slowly decrease as my body feels a greater sense of deep healing. Thanks for your help!! This was my second with Steve and he was as welcoming as the first time. He was also current with my procedures and asked me if I had anything new to report and/or questions to ask. It was a great visit and I look forward to many more! Since my treatments began with Steve 3 weeks ago, I have the energy of a 20 yr. old while lifting furniture cleaning houses. And I’m “powering-up” Q. Anne hill. My core strength is more solid each week and my physical therapist and my counseling therapist (PTSD) notice that my body is more flexible and I have “a wider range of emotions.” I’m almost 67. Thank you Steve! Had my first appt. here today with Jillian. Thoughtful, professional, and calming are some words to describe her. Can't wait for my next appointment! Amanda was awesome and really helped relieve some of my back pain and shoulder pain. Great care, at a very fair price, from extremely knowledgeable acupuncturists. I only have three simple words: Fantastic ~ Fabulous ~ Firstclass!! I had a tailbone injury. It was really really uncomfortable. After 3 or 4 sessions it was almost completely better! Thank you! Relieved my foot and wrist pain by 80% in one visit. VERY reasonably priced so outstanding value for money. Steve was very kind, sensitive and informative, even giving me references for a local chiropractor to supplement my care. He gave me relief for my lower back pain which has bothered me for over a year. Steve and his magic needles always help! I have seen him for everything from PMS to allergies to hip pain and he always knows the right thing to do to make me feel better. Thanks Steve!!! North Seattle community Acupuncture is absolutely the best. Steve Knobler, owner and acupuncturist, and his team are caring, always very encouraging, professional and have done wonders for me. The price is definitely right. I pay $15 per session because that is my insurance co-pay amount. You will never, ever be disappointed here. Gentle and absolute care for my very aching back...that is now fixed! Wonderful, healing acupuncturists. I am pleased to the max w/ this treatment for my spine! I already feel better – The care was exceptional, the facility extremely comfortable. The artwork super fine! Thank you! I have seen Amanda, Laura and Steve and feel they are all excellent practitioners. I always feel listened to and cared for and that the treatment is effective. I appreciate the community service they do. The atmosphere was relaxing from the start of the visit and I was treated with the utmost respect and I was told what was going on with each area of treatment. I would recomend [sic] to friends and family. This place is awesome. The acupuncturists know their stuff. Personal attention with affordable cost. My health and energy are improving through their care. Amazing place! Came to Steve with a fairly severe shoulder injury that my doctor said would take at least 6 months to heal! I'm a very active person, so I was desperate to find a way to help me heal faster. Not only have the acunpuncture [sic] treatments helped me tremendously in healing much faster than expected, but there's the added bonus of having a full hour or so to relax every week. ;) And yes, having a bunch of tiny needles stuck into you and laying around for an hour is actually surprisingly super relaxing (I've definitely nodded off from time to time).Steve is incredible - efficient, caring, and effective. He knows how to find the exact spots that are in need of work and gets right to them. All in a very comfortable and safe atmosphere. You can easily book appointments online and the payment system is super simple. I can't recommend them enough! Both for those who have never tried acupuncture and the veteran pin-cusions [sic] out there, this is the place to go. Amanda Kolter was very helpful + caring. Steve's bedside manner is excellent. It is obvious that he cares about you as a person, nit [sic] just a patient. His outstanding knowledge and practice are obvious. Steve Knobler is a born healer. He is also a superbly skilled acupuncturist. This is by far the best community acupuncture clinic in Seattle. Go, get needled, be healed! The first time I came, I couldn’t sleep well and had a bad shoulder pain. After just a couple of treatments, I improved an 80% in both issues. I am extremely grateful especially to Steve. All the experience at this office has been great! I totally recommend it. Amanda has done an amazing job relieving my migraines- with her unique “neck release” acupressure treatments, acupuncture & herbs. I feel better than I have in 30 years.